Caption: Elephants walking through a channel leading off the Zambezi River, Lower Zambezi National Park, Zambia. Photo: © Roddy Smith. Location: The Lower Zambezi National Park - 4,090 sq km in size - is situated on the northern bank of the Zambezi River, which flows along the park's boundary for about 120km. 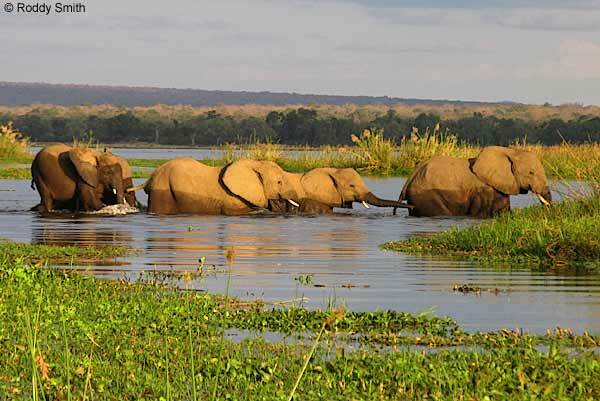 On the opposite side of the river is Zimbabwe's Mana Pools National Park, a World Heritage Site. Animals can cross freely between the two wildlife sanctuaries. Lower Zambezi NP offers an outstanding safari experience for visitors, with options of canoeing, tiger fishing, game drives, and sundowner cruises. There is no camping in the park, but accommodation is provided by a number of upmarket safari lodges.